Since the newlyweds have bought a small house, the East Side Kids decide to do them a favor. Their wedding present is cleaning their new house. After some slapstick by Glimpy, they break into the wrong house. This “spooky” house is actually a hideout for Nazi propagandists, complete with a printing press in the basement. The East Side Kids are initially unaware of this, and decide to “liberate” the furniture from the small house next door to furnish the house. Typical haunted house shenanigans happen — eyes looking through portraits, scary voices, etc. The police are called, the honeymooners return, furniture and printing press move between the two houses. All ends well — except that Glimpy has caught German measles from the Nazi agents (including Bela Lugosi, Dracula) and the newlyweds are quarantined in their small house for seven days – with the East Side Kids. The final sight gag has Glimpy’s measles look like small swastikas. 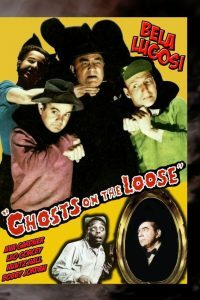 In conclusion, Ghosts on the Loose is a nice little comedy, nothing great but enjoyable fluff. Lugosi is an underground Nazi and Gardner makes her film debut as a nice girl in this comedy-suspense tale. Glimpy’s surprisingly beautiful sister is getting married to Jack, a young engineer, and moving to a ‘bargain’ suburban house neither has ever seen. During the honeymoon, the East Side Kids decide to fix up the house for the newlyweds…but mistakenly pick the ‘haunted’ house next door, which is occupied by some mysterious live men, dodging in and out of secret panels and clearly up to no good.